Success in lacrosse, perhaps more than any other team sport, requires collaboration and a level of mutual, instinctual chemistry between teammates. The field is split into three sections, with rules allowing 15 of the 22 total players — 7 per team plus the goalie that’s on defense— in an offensive zone at once, while each person operates at full speed. The parts of the whole must fulfill their jobs while remaining in sync with everyone else. A complicated task, that’s also what makes a group’s perfection special. 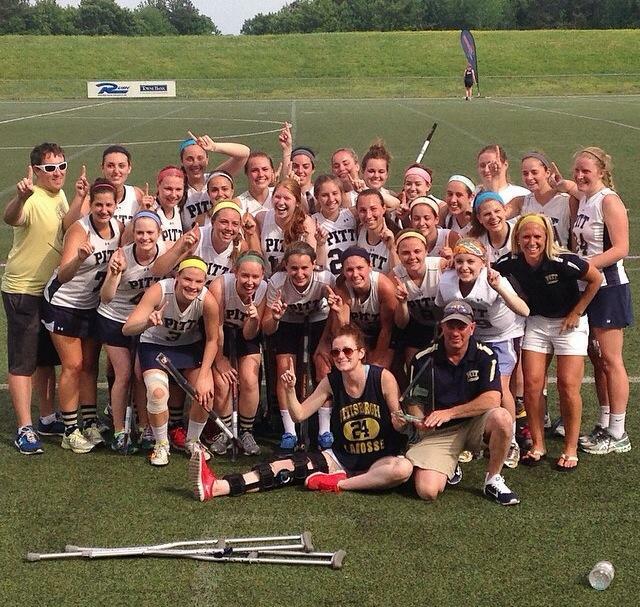 The University of Pittsburgh women’s club lacrosse team entered the Women’s Collegiate Lacrosse Associates (WCLA) national tournament this weekend as the top seed, having won nine straight games and lost just one all year. The team topped the rankings as the best in the country for the majority of the 2014 season, and on Saturday, it solidified its superior standing. History wasn’t on the team’s side. The women had never advanced past the quarterfinal round of the event in its 14-year history before this season. Their highest finish was fifth in 2008. They had never gotten the top seed in the tournament before. They wouldn’t lose in Virginia Beach, Va., during the four-day, 16-team competition. Instead, the team beat No. 15 Boston College 12-11 in the championship game — an ultimate first victory — with the largest audience they’d ever played for. Paul Ohanian, a staff writer for Lacrosse Magazine who covered the tournament, estimated a few hundred people attended. Modesty is no easy task when the seniors had been vowing to one another since freshman year that this would be their year. Staying focused is no easy task when all other teams had finished by the championship, ensuring their contest had everyone’s attention. Michigan and Ohio State, regional rivals of Pitt, cheered on the Panthers while the Eagles picked up their fair share of neutral fan support as well. And it’s no easy task when, with the tournament held on the East Coast for the first time in years, every player on the team had family in the stands for the first time Neft can remember. The Eagles also had achieved a number of firsts themselves with their unexpected journey to the championship. No team seeded that low for the tournament had ever made it that far. As a program, they hadn’t made it this far before either. They upset No. 2 Florida in their first game and took down No. 3 Ohio State in the semifinals. Senior captain and All-American defender Grace Gallagher initially didn’t have many words to describe achieving the goal she and her teammates have worked towards since losing to last year’s champion No. 1 Colorado State in the quarterfinals. A key aspect of that cohesion on Saturday against a BC team that liked to run and play fast was depth. A combined 16 goals were scored in the first half. By game’s end, attacker Meghan Conley scored five goals, three coming in the second half, to lead all players. She would be named the tournament’s top offensive player. Unfortunately for BC, that type of style was Pitt’s forte, too. And they proved the master to the lower seed’s pupil. Ohanian hadn’t covered much WCLA lacrosse this season, but over the course of the tournament a few things became clear. “They [Pitt] like to play that style. They like pushing the pace. They like getting up and down. And they rely on going on scoring runs to seize control of the game at different points. They really are built to do that,” Ohanian said. “Boston College likes playing the same tempo. This final game was a testament to these identical approaches, at least in the first half. “You had both teams willing to go up and down and let their kids go end to end if possible and seize transition opportunities,” he said. But this teacher-student dynamic wasn’t evident early, and if anything, it was inverted. The Panthers trailed 2-0 after five minutes, and then at 3-1, BC had an opportunity to seize momentum further when a BC player was fouled during the scoring of the third goal, which gave her team back possession. The team stormed back with five unanswered goals of its own and didn’t lag behind again, going into halftime with a 9-7 advantage. Sherry, a second-team All-American defender, scored two goals, adding that everyone kept their composure just as that they had in those sorts of situations all year. The team had to rely on its depth to provide the offense on Saturday as it had the entire tournament. According to Neft, Boston College, as the two Pitt opponents before it had done, attempted to take the Panthers’ usual attacking option — All-American senior midfielders Julie McKay and Crista Laustsen — out of the game with tough marking. The tactic worked somewhat with McKay registering a goal and an assist, while Laustsen was held without points. Among a lengthy lists of shoutouts commending their teammates for their role in winning the title post-game, the two captains’ praise of their last line of defense stuck out after such a high scoring fixture. But to Ohanian, there was nothing odd about citing the play of Pitt’s senior goalie as key to the team reaching the final let alone winning it. She finished with seven saves Saturday, not a massive number, but it was when she got those stops that made the difference. Senior Samantha Myers also played an unexpected role, scoring a team-high four goals and collecting a hat-trick during that first offensive outburst in the first half. “Sam Myers had the game of her career today, and they [BC] probably had her so far down the list that she wasn’t even part of their strategy,” Neft said. The volunteer coach of 17 years, founding member of the program, and WCLA’s coach of the year explained that the clutch prevalence of rising to the occasion shared among his team transformed the championship from nothing more than a dream or hope into a reality. Ohanian watched Pitt in the semis and the final as well as parts of its first two games. The 11 seniors, with the help of the rest of their teammates, handled the expectations both, the exterior and those they placed on themselves. Neft views his largest senior class ever as something of an inspiration not only to him but to those players who will return next year. By the time Gallagher and Sherry finished their long-winded, but sincere deferring of credit to so many of their peers, the significance was clear.